I'll explain how that works with me. When you get in touch, we'll arrange a complimentary consultation to talk about your ideas. Yep, absolutely free and there is no obligation to take up my service just because we have that consultation, so you really have nothing to lose! Our consultation can take place wherever it's most convenient for you. You can come to my home studio or I can come to you. Alternatively, we can meet in a café or we can chat via Facetime or WhatsApp if you're a bit further afield. I think it's important to talk with each other face to face as it gives me a better idea of who you are, and your personality will help me design your accessory. 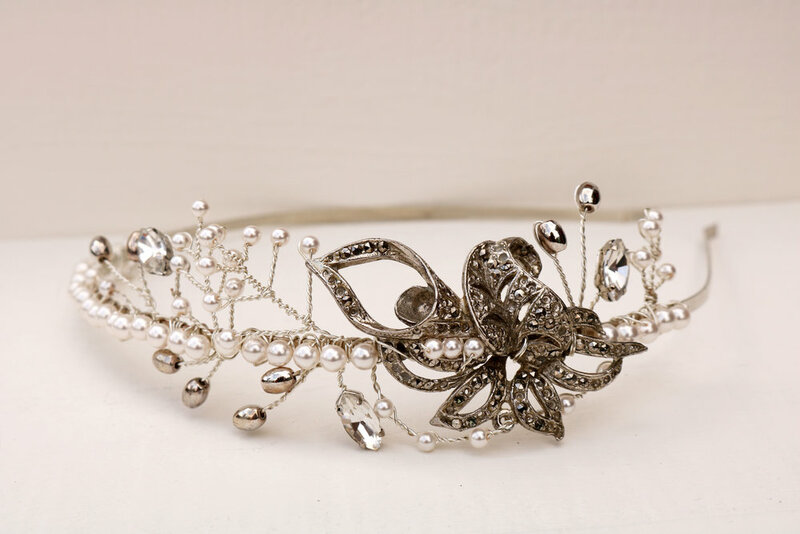 I can also do this for my bridal experiences too, so let me know if you're considering making your own hair accessory or brooch bouquet and we can have a chat and see which experience will work best for you. We're now sat at our chosen meeting place, with a cup of tea/coffee/latté/hot chocolate...insert your preference here!...chatting about how your wedding plans are going and what your initial ideas are for your accessory. I'll have a selection of pieces for you to look at, including a tiara, vine and pins, so that you can take a closer look and see how they feel in your hair. We'll talk through things you like and dislike and see what would work best for your hair type. We'll take a look at my Swarovski colour chart and you can pick out colours to add to your piece, look at the different shapes of crystals available and I'll show you some samples of pearls and other beads I use. You can tell me your ideas, no matter how vague, and I'll listen and make suggestions for you. Maybe you have an old brooch from a relative that's passed away and you'd like to include it as your something old; anything is possible at this stage and there is a chance I may be able to incorporate it into your hair accessory. I'll scribble down some notes and put together a quick sketch of how I imagine your hair piece to look, based on all the things we've talked about. I'll give you a rough idea of how much your hair piece is likely to cost and then follow up with your official quote later that day. Once we've had our initial consultation and you've received your quote, you'll need to pay a deposit to secure your booking. This will be 25% of the total price of your order and the remainder will be due a month later, although I can arrange instalment payments for larger orders if you need to spread the cost, as long as your order exceeds £100. Payments can be made online via BACS or in cash - all you need to do is let me know which method you prefer. Then the magic begins :) I start creating your accessory and keep you updated on progress along the way. Once your piece is finished, I'll place it carefully in a beautiful box, tied with silver satin ribbon, ready for you to collect or to be sent to you, complete with a little something blue for good luck on your wedding day. And if you decide you don't want to go ahead after our initial consultation, I won't be offended as I appreciate that I can't be a perfect match for everyone, as much as I want to be. If you're not sure about an idea I've presented, just let me know; I will rework the design until you're happy with it and it's much easier to make those changes in the earlier stages of the process. It may be that you're looking for something with a completely different style, in which case, I know some other lovely designers who may be able to help you create your perfect accessory; your wedding, your way. No pressure and certainly no hard sell, as it's not the way I like to work and I can imagine that, after going around countless wedding exhibitions and being pitched to by suppliers, it's the last thing you want too! So why is going bespoke worth it? It's all about the experience. It's one less stress off your shoulders and I work hard to make sure that you are comfortable, happy and get exactly what you want. No two accessories will be the same as they are reflections of the unique women that inspired them. Your accessory will be named after you and will become an heirloom that you'll want to pass down to the next generation as their "something borrowed". And the real cost of having a bespoke design? You may find it costs you less than you thought. 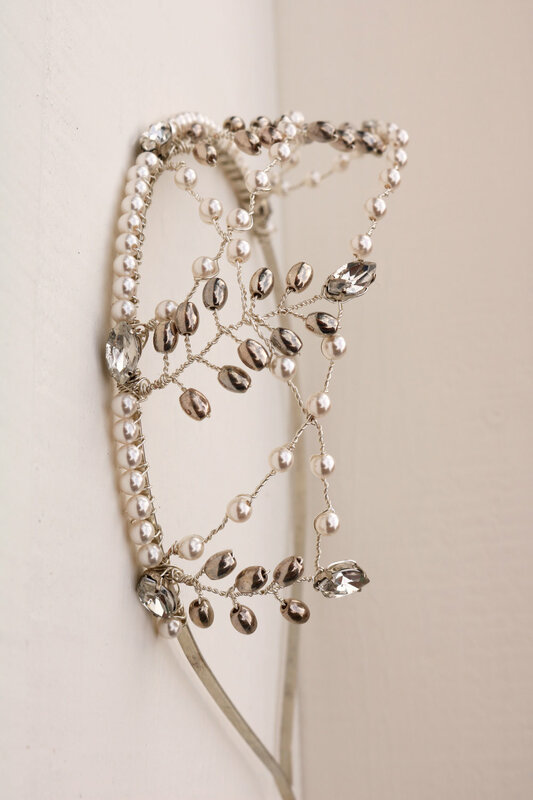 A custom-made tiara or hair vine starts around £100, depending on the detail, design and size. Plus you get the peace of mind of knowing you're in safe hands, that you can check in at any point and that it will be a perfect fit for you on your wedding day. No nasty surprises and think of the time you'll save hunting for an accessory to compliment your dress and personal style. All you'll need to do is sit back, have a glass of Prosecco and get excited for the big reveal. It'll be worth it, I promise.